Thanks to everyone who entered our Rock the World Sweepstakes! Our winner was chosen at random from all of the entries. Congratulations to Kristina D. from Cottage Hills, Illinois, who wins two tickets to Rock the World! 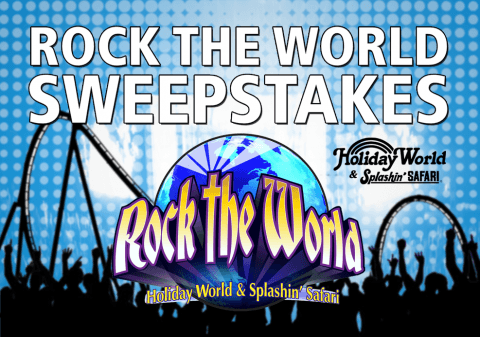 Let’s start off the new year with a sweepstakes for Rock the World! We’re super excited about our incredible headliners for this year’s event and want to give away a pair of tickets. Holiday World & Splashin’ Safari employees (and the immediate family members of employees) are not eligible to enter. Use the widget, below, to enter daily. There are lots of options, so you can earn extra entries by posting here on our HoliBlog, tweeting about this sweepstakes, following us on Pinterest and visiting us on our Facebook page. By entering our contest, you agree to be added to our “Rock the World” e-newsletter list. You may unsubscribe at any time by following the directions in your email. Our winner – chosen at random – will be emailed on January 7, 2015. Did you know you can subscribe to our HoliBlog so that you receive all of our posts (including contests) by email? If you’re using a desktop computer or tablet, look for the “Subscribe to Blog” sidebar at the top-right corner of this page. On a smartphone? Just scroll down a tiny bit more to find it. Ready to enter? Of course you are. Simply enter our sweepstakes here from a mobile device; or if you’re using an immobile device, enter by using the widget, below. And not just today – enter daily through Tuesday night, January 6, 2015, at midnight CST. Good luck to all – and be sure to check out our HolidayWorldRocks.com page for more details about Rock the World! Super excited for Rock the World!!! We rocked the world even through the thunderstorms last summer and are ready to do it again with Newsboys and all!! So blessed to have Holiday World, a place that isn’t afraid to proclaim Christ, so close to home. Maybe we’ll get to go this year! I would love to attend this at Holiday World. We love your park. Holiday World Rocks and I look forward to see the Newsboys in 2015. Even though school will already be started for the kids in Southern Indiana, we’d like to take a group to experience the amazing music and enjoy the day. High school homework can go on the back burner for one day, right? Holiday World never disappoints; adding wall to wall Christian performances will be the icing on the cake! I can not wait for Rock the World. It is a great line-up this year and any time you can see a Christian band that is close, it is a must to go! This area is in such a need for Christ and what better way for Holiday World to use their resources to bring in Christian artists and support them and their desire to spread the gospel. Thank you for Rock the World…not every theme park would do this! Its great to see so many Christian artists together at once. I would love to win so I can worship and praise God through the many amazing voices singing in his name there. I’m so ready for this year!!! Last year was my first time going and I wish I would have known about this awesome event. Rain or shine I’m ready for this year. Nothing will stop this concert!!!!! I hope I win the tickets to Rock the World! We LOVE Holiday World!!! We have made it a family traditions to go every summer and have a blast every time! Would love to attend this with my family…we could buy two, get two free!!! Thunderbird, here we come! I’m soooo excited for rock the world this year because Newsboys and Crowder and Sidewalk Prophets are Hands Down 3 of my top 10 FAVORITE Bands and hopefully to come and see them perform all at the same place would be FANTASTIC!!! Praising Jesus with my family and other believers at a concert with that awesome line up will be amazing. Doing it without ticket cost would be a bigger blessing!! Would love to ROCK THE WORLD 2015!! Last year we took our youth group to Rock the World. In today’s world where we are bombarded with the message that the Christian faith is out of date and useless, it’s really good for our kids to see that there ARE a lot of other Christians in this world. And that its okay to have fun when we worship God. The musicians weren’t just good artists, they were also good speakers who took a minute to share God with the kids through the crowd, not just their music. I would love to win tickets to this awesome concert!!!! I want to come to Rock the World!!! I haven’t been able to go since the inaugural event and would love to go this year. I was at the first one would love to return this year. “I AM” hoping to win these… If I do I will “COME ALIVE ” “THIS I KNOW “!! “AFTER ALL ” I love CROWDER! “COME ALIVE ” “THIS I KNOW”! “AFTER ALL” I Love CROWDER!